Vegetables are an important part of any diet. They provide valuable fiber, antioxidants, and other powerful phytochemicals. 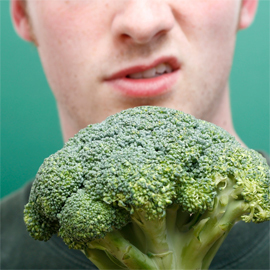 Obviously, you should be eating your vegetables whenever possible! But what do you do if you don’t like the taste of vegetables? Here are a few suggestions to make eating your vegetables easier. 1. Add vegetables to soup. Most homemade recipes will call for vegetables, but many canned varieties can be beefed up (or veggied up) by stirring in frozen vegetables when you’re heating the soup up. 2. Try vegetables raw. Raw veggies often have a milder taste than cooked ones, and a crispy texture is usually preferable to a mushy one. 3. Use dip. A squeeze of lemon juice combined with fresh carrots, celery or broccoli can be your healthy version of chips and dip. 4. Top your pizza with vegetables. Flat-crust low-fat Pizza is a popular food favorite and an easy place to hide vegetables. The smaller you chop them, the harder it will be to detect the taste. 5. Drink your vegetables. Buy a ready-made vegetable juice, or blend your own vegetable and fruit combo. 6. Slip your vegetables into your sauces. You can add a variety of vegetables to spaghetti sauce and get the added vitamins without an overpowering flavor. Try zucchini, onions, celery, or carrots. 7. Learn to grill vegetables. Brush vegetables with lemon juice or low-fat Italian dressing and put them straight on the grill. 8. Put vegetables on your sandwiches. An endless variety of vegetables can add texture and taste to your favorite sandwiches. Try sun-dried tomato, sliced avocado or fresh sprouts. 9. Add cheese. An old stand-by trick, melt a few slices of low-fat or sprinkle parmesan cheese over broccoli or cauliflower to mask the vegetable taste. 10. Add your least hated vegetables to your most loved foods. Take baby steps by adding a little bit of the vegetables you can tolerate into your favorite dishes. Stir in broccoli, tomatoes or mushrooms into anything. With all of the benefits that eating vegetables provides, it’s important to find a way to get these vitamin rich foods into your diet.